ROME — Christians nationwide are expressing concerns following Wednesday’s Catholic observance of the Feast of the Queenship of Mary—one of a number of holidays on the liturgical calendar—and are emphasizing the need for evangelism. On the Roman Catholic holiday, Pope Benedict addressed a crowd of international followers at the courtyard of the Castel Gandalfo in Rome, declaring that Christians should look to Mary to find answers in life, and that prayers should continually be sent to her. 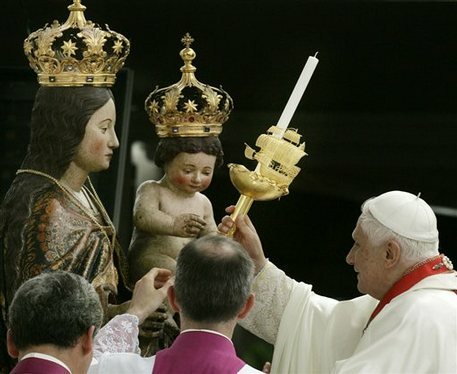 According to reports, the “Feast of the Queenship of Mary” was established by Pope Pius XII in 1954, and was originally celebrated on May 31st. However, the date was later changed by Pope Paul VI to August 22, in order to place it eight days after the observance of the Assumption, a date marking Mary’s purported ascension into Heaven. Catholics believe that at the end of Mary’s life, she was received into Heaven both body and spirit. Pope Paul John Paul II explained in 2004 that when Christ said, “If I go and prepare a place for you, I will come again, and will receive you to myself; that where I am, you may be there also,” Mary became the ‘pledge’ to the promise. “To him who rules the world and holds the destinies of the universe, we turn with confidence, through the Virgin Mary,” he said. However, most evangelical Christians have nothing to do with the observance and many condemn it. Some have never heard of the holiday. The evangelists state, however, that they are not only concerned with the Vatican’s emphasis on Mary, but also a number of other doctrines that conflict with the heart of the gospel. He added that most Christians, however, do not know how to articulate the gospel, and need to study the Scriptures and share them with others. “There are some very helpful resources,” Speed said, noting that Mike Gendron of Proclaiming the Gospel Ministries offers a variety of materials to Christians who want to learn more about how to share their faith with Roman Catholics. According to the liturgical calendar, today is the Catholic Feast of St. Bartholomew.